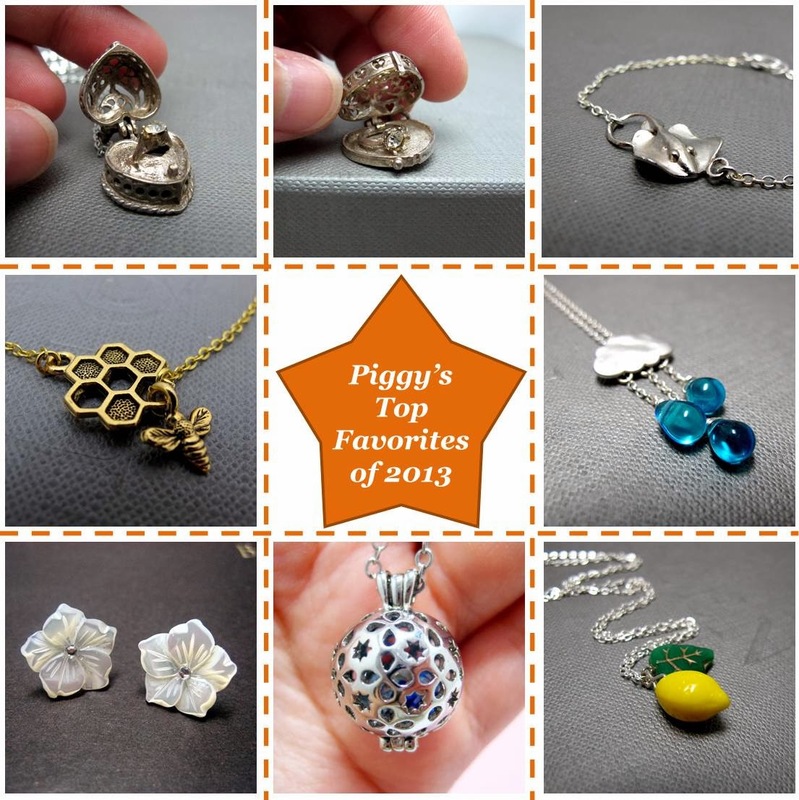 One final thing before I bid farewell to 2013, is to compile Piggy's Top Favorites. These are the top items in my Etsy shop that were hearted by fans and customers. They also happened to be my most popular items (except for the first 2 as they were vintage pieces - only pieces). Each of them are special to me in different ways. Have a browse and see if they are your favorites too. Will You Marry Me II Necklace US$140.00 - This little beauty during my vintage trip to UK. Love the little rhinestone ring and the locket that opens up like a proposal ring to your wife / partner to be. Will You Marry Me Necklace SOLD - Like the first piece, this beauty was found during my vintage trip to UK and was sold earlier in May. Silver Stingray Bracelet US$12.00 - This bracelet was first made in brass and later silver plated. I ♥ the stingray's tail that curls up into a loop which allowed me to design this bracelet. Here's the brass version. Raindrop Keep Falling Necklace US$22.00 - Definitely my favorite necklace of all time. I ♥ the shot of the piece. I also ♥ changing up the necklace with different color raindrops. Cherry Blossom IV Stud Earrings US$21.00 - I made quite a number of cherry blossoms stud earrings. This was the fourth! I am fascinated about cherry blossoms. They remind me of Spring, tea and Japan. My Secret Galaxy Necklace US20.00 - This is one of my earlier designs. I re-shot the photo of the necklace and the results were much better. I enjoy shaking the ball locket and listen to the crystals rattle. Lemon Tree Necklace US$14.00 - This necklace was inspired by a vintage fruit basket design that I read in vintage jewelry book. The yellow color of the lemon really pops as it matches with the green leaf glass bead. Here's the strawberry version.